At FreeVis, we use only state-of-the-art diagnostic and laser equipment. 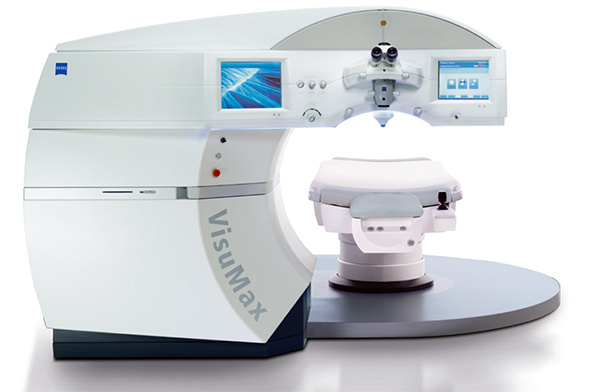 The VisuMax is a ground-breaking laser system employing high-performance femtosecond laser technology with outstanding cutting precision, unsurpassed speed and gentle treatment technique. - SMILE, a precise lenticule preparation and extraction to provide minimally invasive vision correction. (1) Each laser pulse creates a mini-gas bubble (diameter of 1 µm). (2) A larger mini-gas/water bubble of approx. 5 - 12 µm diameter appears and separates the surrounding corneal tissue (photodisruption). (3) The emerging mixture of CO2 and water is aspirated, leaving the separated corneal tissue behind. (4) Three-dimensional, high-precision laser cuts are created within the cornea by placing thousands of computer-positioned laser pulses next to each other. 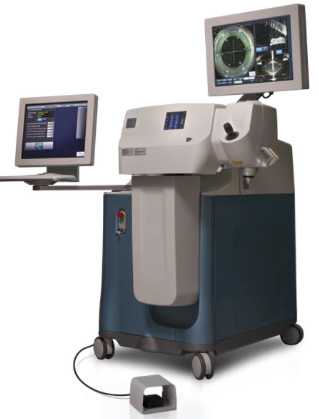 The LensX was the first femtosecond laser approved for the femto cataract procedure. Professor Michael Knorz has been involved in the development of this so called laser lens exchange and has been offering the procedure at FreeVis since 2011. A femtosecond laser is an infrared laser that works at a wavelength of 1.052 nm. It emits ultrashort laser pulses with a diameter of 0.001 mm at one-billionth of a second (10-15 s). With the femtosecond laser, tissue can be cut very precisely and with practically no heat development. The laser pulses deploy their energy at an exactly defined depth inside the cornea. (4) places strategically located cuts to correct an accompanying astigmatism. The Schwind Amaris 1050RS is an excimer laser specially developed to perform TransPRK (also called SmartSurf PRK) in a safe, fast and efficient manner. The innovative laser system delivers an unsurpassed repetition rate of 1050 Hz – currently the highest of all excimer lasers on the market. The excimer laser has been used for laser vision correction since 1987. It produces a beam of ultraviolet laser light whose energy is immediately absorbed when it encounters the water-containing tissue of the cornea. The excimer laser literally vaporizes the corneal surface without causing any surrounding thermal injury. Thus, the excimer laser can precisely sculpt the corneal surface and change its contour (= photoablation). The corneal wavefront is emerging as a new tool for defining the optical status of the cornea as well as the entire eye. Analysis of the corneal wavefront can help clinicians understand symptoms, make diagnoses, and design surgeries. While a traditional LASIK is based on correction values that were determined with eyeglasses or contact lenses, wavefront analysis allows for an optimized treatment. It measures the refractive power of the eye at more than 25.000 different spots and produces a "map of the eye", which contains the precise refractive power for every measured spot and is often called "fingerprint of your vision". This map is later used to perform the vision correction by taking tiny differences in the refractive power of the cornea into account, therefore optimizing the result. Iris registration is an alignment method that provides greater accuracy. An advancement over standard alignment practices, iris registration achieves alignment by automatically linking a patient's diagnostic information with the laser treatment. Iris registration then centers the treatment correctly, independent of changes in the pupil center from measurement to treatment. This process also allows for instant re-registration in the event of intraoperative cyclotorsional movement. These technologies ensure a precise ablation. By continually changing the size and placement of the beam. Variable Repetition Rate technology provides an accurate reconstruction of the wavefront profile, smoother ablation profiles and faster treatment times. Variable spot scanning and variable repetition rate also minimize thermal effects and provide potentially better overall outcomes, including night vision quality.